It feels like this quilt has been in the works for a long, long time! In my opinion 2015 is ancient history! 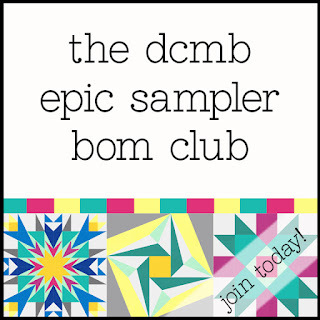 I signed up for Elizabeth Dackson's (Don't Call Me Betsy) Epic Sampler BOM in October 2015. 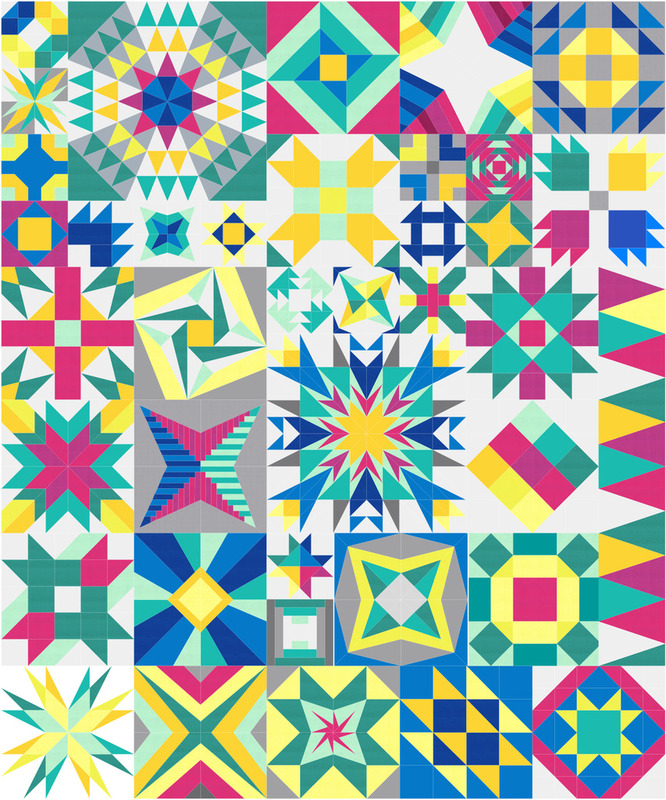 What drew me to this Block of the Month was the design (naturally), and the fact that much of it was paper pieced. Which at the time was still pretty new to me. Look at it! Could you resist?! If you know me you know I usually jump in and ask questions later. Then there's the realization...'you have to pick fabric, Jayne'! Long story short, I decided to get wild and go rainbow. Which isn't a bad way to go, except for the fact that it's a lot harder to do! I colored a blank color page at the beginning for a loose reference, a guide to the rainbow. I was hoping to use scraps for each block and I really did try. But there were times when I had to hack into a fat quarter or yardage. Which was totally fine and to be expected. My very last post was: Nearing The End :: Epic BOM :: Finale, where I had assembled all the blocks and sat back to marvel at the finish. That was Tuesday, October 2016. You know what happens after block assembly?! Quilting. Blah! I knew each block would need it's own special quilting design. I was pumped and ready...for about 2 1/2 seconds! I had every intention of quilting it myself and went so far as to pin the layers into a beautiful quilt sandwich. October came and went, November...December...NEW YEARS...January, February, March and then April. Six months of looking at this quilt pinned and ready for quilting yet knowing full well I would never, could never do it justice. And then one day, the clouds parted and a ray of sunshine beamed directly on this quilt...SCREECH!!! Kidding about that part! I was ready for some magic and a professional to handle this quilt. Only they could do it justice! Cue the professional...Jill! Jill is one of the members of our guild who has made my jaw drop on many occasions with her long arm quilting skills. Check out her instagram feed: sewsouthern_jill. I unpinned every pin, thinking with each one that I was doing the right thing. I knew Jill would give it the royal treatment, the cherry on top! Each block was treated like royalty! Regardless the size of the block, each one was treated with a special custom design. I squealed with joy mostly because it was gorgeous, but I have to admit ... it was a relief that I didn't have to quilt it. I just knew I would mess it up! I don't often splurge on getting my quilts professionally quilted. I wish I could do it more often! It's always a special treat when I can do it and I have never been disappointed! That big 18" block...was the hardest block I have ever paper pieced...ever! It turned out to be fine, not perfect! The binding and backing is Kona Medium Gray. Neutral and simple. There's a lot happening on the front with color, restraint was in order! I especially loved making these blocks. Paper piecing makes me very, very happy! 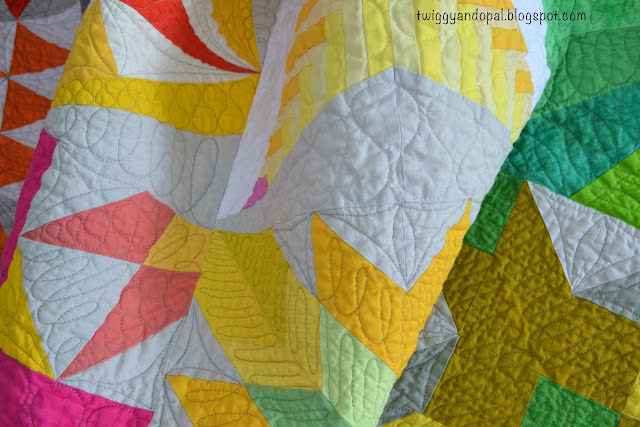 Wow - it's stunning, your work, the explosion of colour and quilting. I've just finished a quilt I started in 2015 too, so pleased it's done. I was so happy to get this quilt pieced together, but not so happy to quilt it! I think the right call was made to send it out! This quilt is amazing!! Congrats on a wonderful finish!! It's beyond stunning! So glad you splurged and had it quilted! Now it's a finish to be proud of! It doesn’t happen often that I can splurge on long arm quilting. 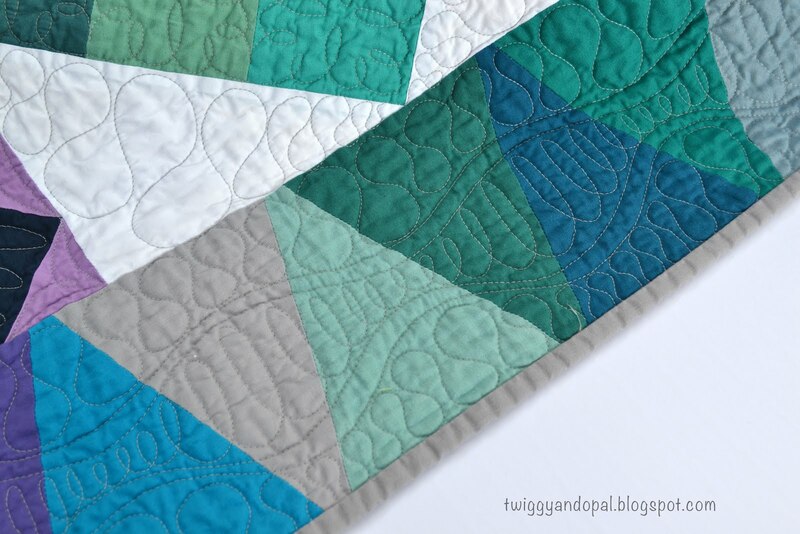 Some quilts just need that special touch and are way worth it…I could never have done it justice! It turned out just fab! Awesome finish! 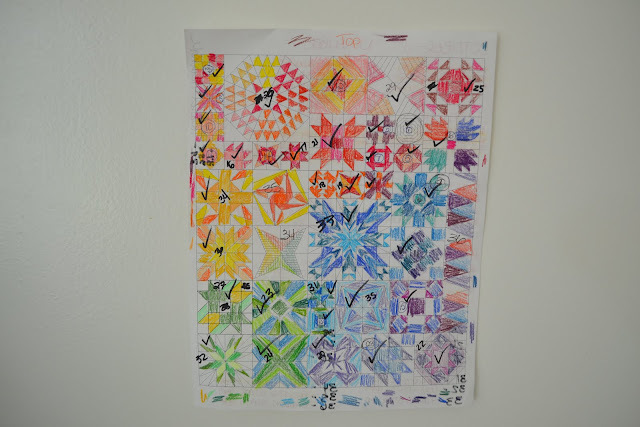 Love seeing your coloring chart too! It turned out beautifully, Jayne!! It's gorgeous! I love the rainbow color palette. You used it very effectively. Whew! What a wonderful finish!! 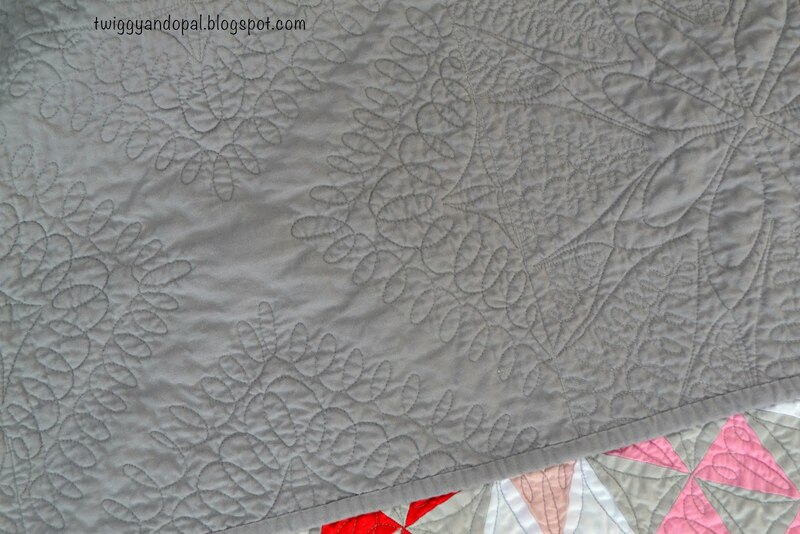 It's so nice to have something like this quilted by someone else now and than - what a treat! Jayne, that is just gorgeous! Definitely worth a squeal (or two)! I love all the different blocks, the bright color, and the quilting, too. It is stunning! So glad it is finished so you can start enjoying it. 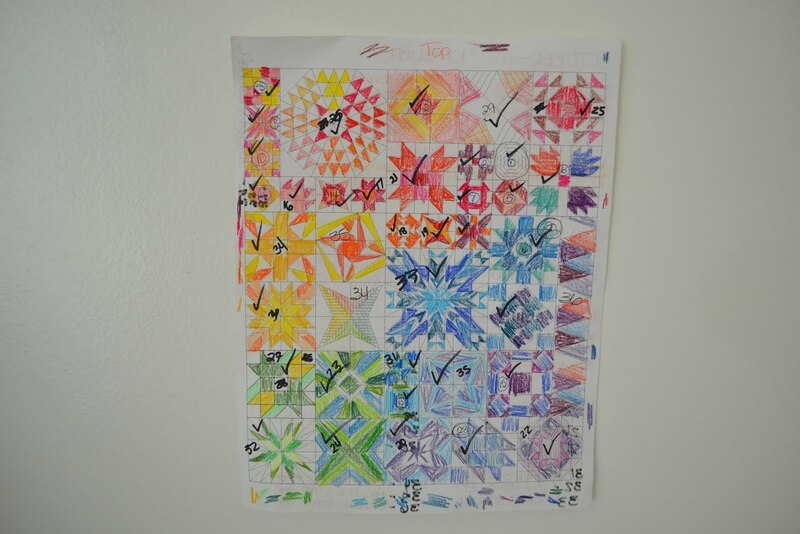 You did such a great job in your color work. Thanks for sharing with Oh Scrap! Congratulations on a gorgeous finish, Jayne! 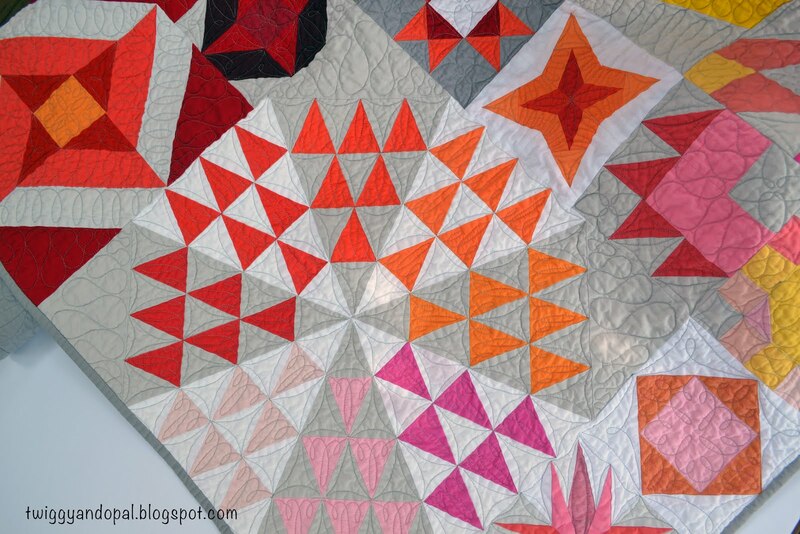 This quilt is wonderful in every aspect! Beautiful! 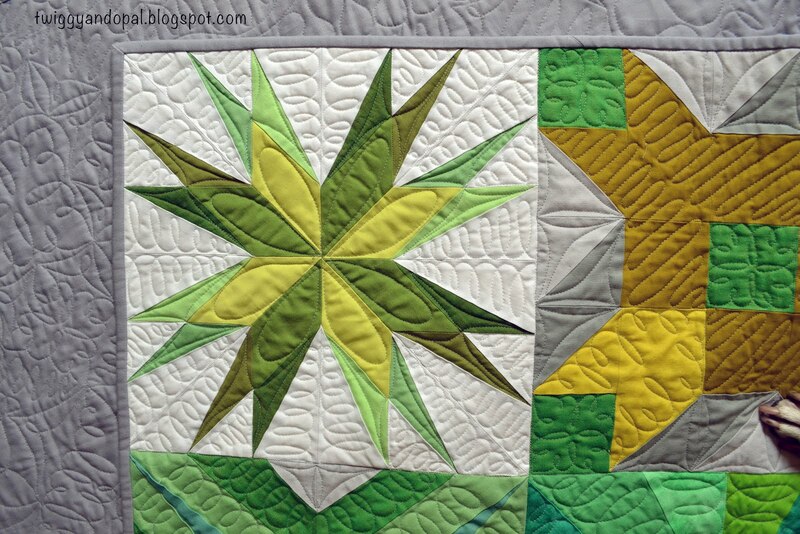 The quilting compliments the piecing very well! If I hadn’t had that long arm connection…It would still be sitting pinned! Congrats on your wonderful piecing and color sense. You picked the right person to do such elegant quilting. Enjoy! It's a beautiful quilt Jayne! Congrats on such an epic finish!! This quilt is amazing Jayne ! You did a great job in colour placement. A finish to be proud of. Love it Jayne! Epic for sure!! This is beautiful!!! I love when these types of quilts get custom quilting jobs...warms my heart. She did an amazing job with all that quilting. Great quilt. It is so intimidating to have a quilt you really love staring you in the face saying "quilt me!" Being honest with yourself and giving it to a professional was a smart thing to do. 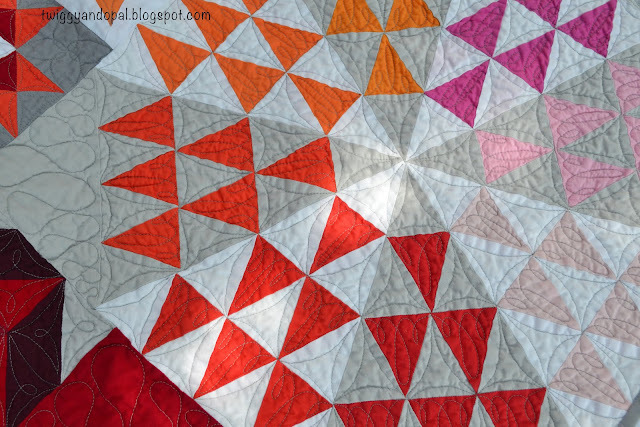 You are now enjoying a finished quilt and the quilting really enhances the piecing. Enjoy your quilt! it's absolutely stunning. I really need to make a rainbow quilt. 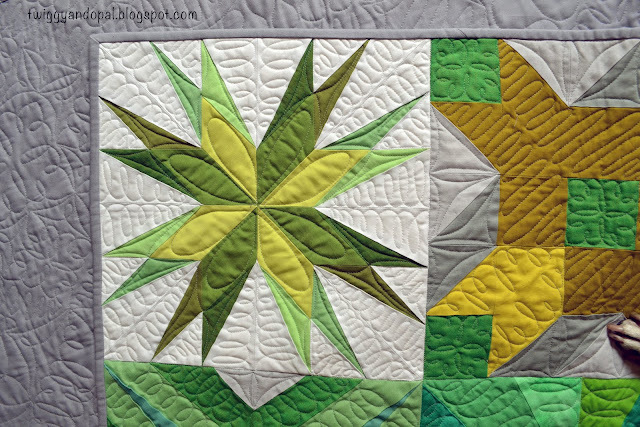 I have aspirations to be able to do custom quilting like that... but then that would involve actually doing some quilting so it's probably not going to happen! I don't have the words Jayne. This is crazy gorgeous. All that paper piecing. It would have made me nuts. You did a spectacular job as did your friend who quilted this. Just amazing. Fabulous quilt, Jayne!!! 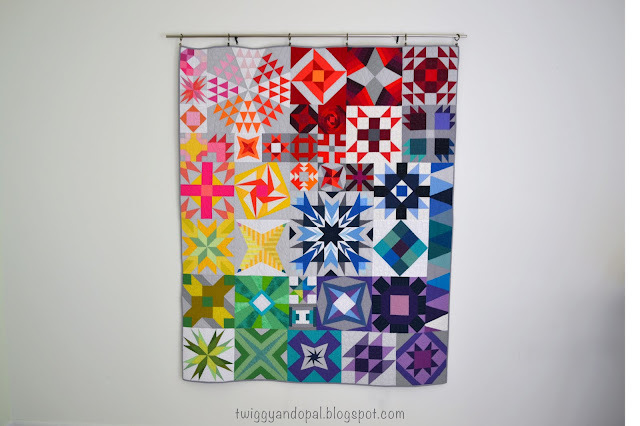 The colors, the various blocks, and that quilting!!!! Beautiful! 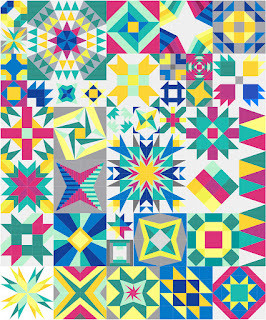 I am not sure that word is strong enough for how utterly amazing this quilt looks. And the quilting is phenomenal. Great job on the finish!! It must be quite a feeling of relief and pleasure to have this beautiful quilt finished. 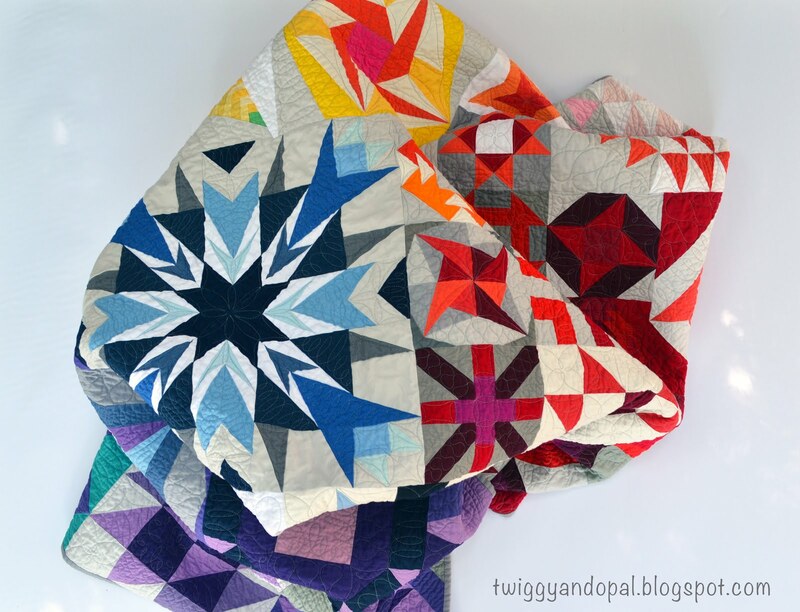 Those blocks are all gorgeous and you know I love the solids! You did an amazing job of choosing the perfect colors for the blocks and their backgrounds. 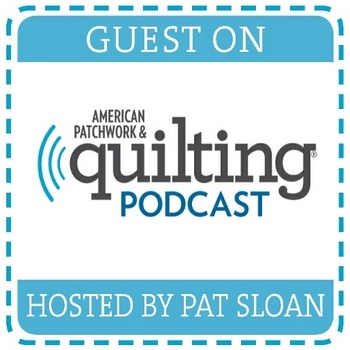 And the quilting is such a compliment! Oh, I know that feeling of freezing at the quilting so, so well. It's why I have a bunch of tops on a shelf! This quilt turned out looking great. I bet you're really doing a happy dance! Well, for your standards, Jayne, perhaps this finish has taken a while, but I also think it's kind of fun to have a project that you can "chew on" for a while. 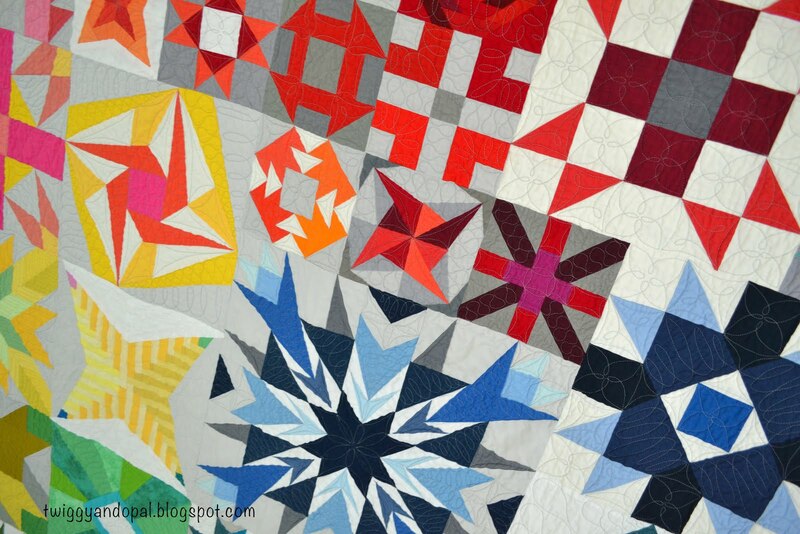 Epic quilts like this deserve epic quilting... I would have been totally clueless how to treat each block with special care. It turned out really, really lovely... from the blocks to the quilting. 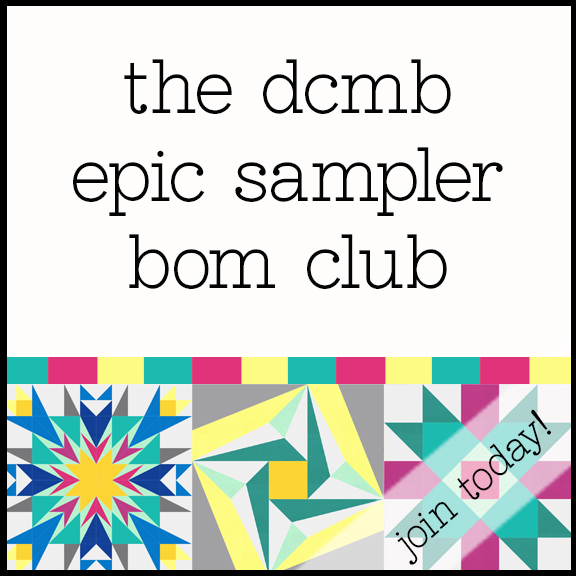 In any case, I'll be excited to see the next epic quilt that you take on. Enjoy snuggling under this one!